The PRO fully adjustable Bench is the super heavy duty bench which will enable you to work on your powerlifting! Shipping unfortunately excludes all postcodes beginning with AB, BT, IV, KA, KW, PA, PH, IM, JE, GY & ZE. To ship here please ask for a quote, most just have a surcharge of only £16. 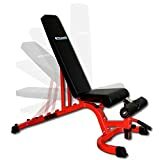 This heavy duty bench is the cornerstone for any gym, professional or home. The Super 7000 the same as the best selling Super 7 but also features dual wheels at the rear of the bench and a handle on the front which enables you to quickly and easily move this bench in and out of your power racks, cages, etc and around your gym. Trusted by professional British athletes, clubs, gyms, PTs and many high quality home gyms. With flat, incline, decline and military press positions any user will be able to perform an abundance of workouts for their entire body from a simple dumbbell press to bent over back rows, sit ups and a shoulder press to mention just a few. Includes 5 Years Gymano International Warranty. Shipping unfortunetly excludes all postcodes beginning with AB, BT, IV, KA, KW, PA, PH, IM, JE, GY & ZE. To ship here please ask for a quote, most just have a surcharge of only £16.